Trade shows can be stand-alone affairs or an integral part of your conference or educational event. But, just because you have a trade show or exhibition doesn’t mean people will attend. The organization of all trade shows requires the event host to consider encouraging attendees to visit the exhibitors’ booths. This is known as generating traffic. Your communications strategy will be targeted to generating participation in the trade show by both exhibitors and audience. But, you could be doing more to assist exhibitors by increasing the number of visitors to their booths. If the trade show is part of a conference, you should build some program events to take place on the trade show floor. Consider all activities that don’t include a speaker as exhibit attendance opportunities from breakfast to breaks to lunch to receptions. Some trade shows also included dedicated times during the program for exhibit visiting, but you will need to weigh this against other program requirements as well as your overall goals and objectives. Depending on the size of the trade show, you may want to consider an exhibit passport. 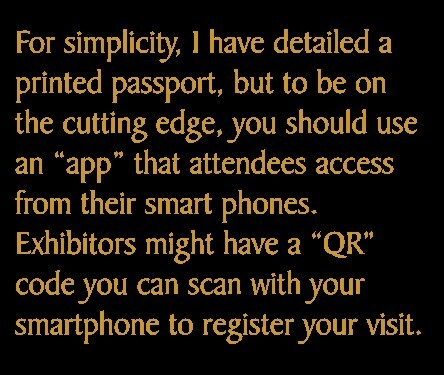 This is a printed document provided to participants at registration which includes space for attendees to collect proof that the attendee has visited the exhibitor’s booth (usually by way of initials, an answer to a trivia question or a stamp of some sort). Once complete, the attendee will return the passport to Show Management to be included in a draw for something that is valuable to the attendee (a necessary incentive to encourage visiting as many booths as possible). For larger or more diverse shows, it might be possible to operate this passport on a subset of exhibitors (say 50% or a designated market segment). This might result in more targeted traffic to the booths and result in happier exhibitors as exhibitors are most interested in qualified leads or visitors who are actual potential customers rather than having resources consumed by visitors unlikely to influence purchasing decisions. One of the challenges of a trade show is maintaining the interest of conference registrants. Another way of attracting attendance is to have prize draws on the show floor for which attendees have to be present in order to win. However, make sure that attendees will be present as it is very embarrassing for all involved if a long string of names are drawn and none are present. It is also important to make sure that your trade show is a place participants want to be – not just for the food and beverage or the draws – but because it is a welcoming place. Consider the flow of your show when designing the floor plan and include gathering spots, soft furniture seating, tall standing tables and internet kiosks to make the exhibition a welcoming environment. Lastly, listen to the suggestions of your exhibitors. In many cases they have worked lots of shows, often nationally or internationally. They may have seen something that works particularly well for your audience. Remember, building it is not enough for them to come. You need concrete strategies to get attendees to spend time on the show floor and to interact with exhibit staff. Your exhibitors will thank you by returning for future shows. What Good is a Name Badge If You Can’t Read it? 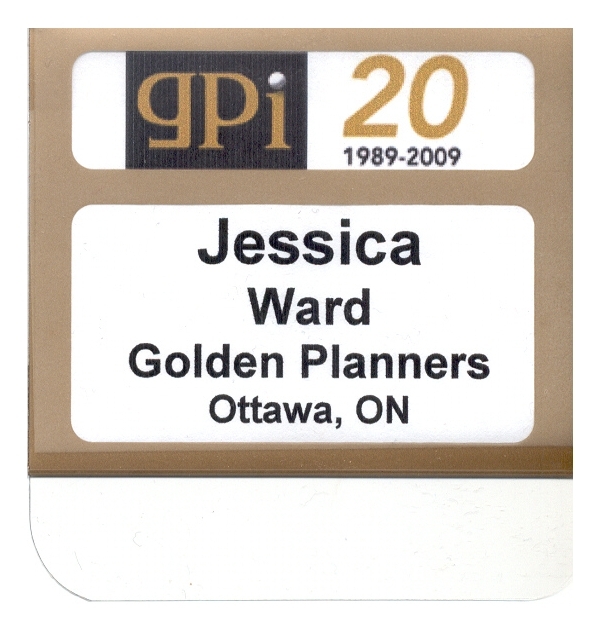 The name badge is an important, yet inexpensive, marketing tool! Make no mistake, the name badge isn’t just proof that someone has checked in at your event, it is the simplest networking tool you can provide. Use it to your full advantage. Don’t overcrowd the badge! Keep it simple and maximize the print area by using larger size fonts for the information that’s most important to see readily: the name of the person. Design the badge to include your branding at the top or bottom, one line for their first name (in larger font), another line their family name in slightly smaller font, and a third line for their organization. You may want to add a fourth line to include the city/province or, for international events, the country, which can help break the ice between attendees who don’t know each other. Make sure you use your event branding on the badge. This is a simple and easy opportunity to reinforce your brand and keeps everything nicely tied together. If the branding on the name badge needs to be bilingual, plan for a concise design so that the text will be legible on the badge. Ever noticed how badges attached to a lanyard or string flip over and all you see is the back of a blank name badge? If you are not using the back of the badge for personalized agendas, print the same information on both sides of the name badge, and voilà! The name badge functions properly at all times. If you need to use both sides for different information, consider lanyards with two clips (one for each top corner). If your delegates are asked to pre-select their conference sessions, use the back of the badge to print their personalized individual agenda, including room assignments. Not everyone likes lanyards, so make sure you offer the option of a lapel clip. Most badges are designed to accommodate both. And, let’s face it, it’s easier to read a badge from someone’s lapel. On the other hand, be careful not to suggest to someone that they attach a ‘clip/pin’ type badge to their expensive suit jacket or fancy dress! Choose the right badge holder – it’s as important as the design of the badge itself! Is the badge holder meant to hold banquet tickets or a ‘pocket’ program? If so, make sure you choose the right sized badge holder. Should the badge holder be totally clear or should it have a colour bar at the bottom which could be used for colour coding of categories of registration (e.g., exhibitors, speakers, sponsors, etc.)? Registration is the first on-site experience of your event your attendees will have. By making sure the name badge is professional, efficient and effective, you are creating a positive first impression. Above all else, never, under any circumstances, ask your participants to write their name on a sticky peel-off label that says “Hello… My name is”. In the first Golden Nugget, we reviewed the importance of goals and objectives as the crucial starting point to achieve event success. The second step is a detailed Critical Path, also known as a work plan. Event management is a stressful activity – telling your participants to come back tomorrow or next week because you are not ready is not an option! There are a myriad of tools that can be used to build a work plan from a “to do” list scribbled on a sheet of paper all the way through to an automated process using project management software. To some degree, the process you use will be driven by the complexity of the endeavour and your comfort with the mechanism. The basics remain the same however. You need a plan to get you to the successful completion of the event. With that in mind, work back from the start date of the event and plan all the components backwards. For example, if something needs to arrive at the event facility the day before the first day of the conference, research shipping times based on the method of shipping you plan to use (air or ground) to determine the deadline for shipping. If you are going to print a Final Program, generally allow two weeks for printing from the time of final artwork. This means that you need to allow time before that for the graphic design of the final program which means that all the details in the program have to be confirmed before that. When you are developing the work plan, it is best to focus on one component of the planning at a time. For example, develop the list of tasks and timeframes related to logistics (and you can further break it down into subcategories such as audio-visual, room design, food and beverage, etc) and then do marketing and communications. As you include all tasks that need to be accomplished in your work plan, consider who should “own” responsibility for it and assign this responsibility right in the work plan. This way when you review the work plan (which you should do with all the members of your planning team on a regular basis), if someone is having a challenge meeting a deadline, you will know and be able to reassign resources or provide additional help. Once you have completed the work plan, sort it in various ways (chronologically, by resource, by task area, etc.) to determine if you have accidentally created roadblocks. If you find something that is scheduled to be completed after a task that depends on its completion is scheduled to start, adjust the timing of one or the other (for example speaker recruitment and program promotion). Sometimes, your plan will have too many things happening at the same time which will likely result in a key task not being accomplished. Periodically review the plan to see if there are different tasks scheduled to be started or completed at the same time and evaluate if the assigned resource(s) will be able to achieve the expected outcome. 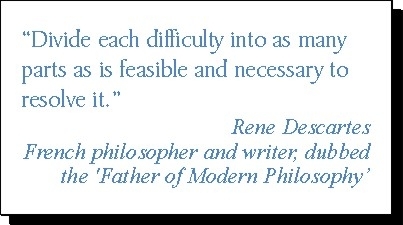 If there is any doubt, add some time to the critical path for this task. This will be an important component of your risk mitigation. Events happen in real time so your work plan should be a living document. Update it when circumstances change and tasks are completed so you are prepared if (and when) something doesn’t go as expected. So remember the famous words, Plan to work and work to plan! The quote may be anonymous, but a good plan will be remembered as yours. “Who’s on first, What’s on second” may be the most famous classic comedy routine by Abbot and Costello, but it could also be a mantra for the questions every event organizer should be asking before they start the process of planning an event. In order to have a successful outcome, you need to know what you want that outcome to be. In other words “what are your goals and objectives for the event?”. Goals and objectives come in many shapes and forms such as learning, financial, communications, organizational, to name a few. Sit back and ask yourself what is the prime purpose of the meeting? What is your target audience and what are their needs? Does the event need to make money? These simple questions will help you advance to more detailed objectives. Most business events have some form of learning objective as their root raison d’être. Whether it is an academic/medical/scientific conference convened to share current research or best practices, or an annual association conference to advance membership knowledge or a sales meeting to release a new product or service, one would be well served to understand the concepts of continuing education and the statement of learning objectives. The Convention Industry Council’s Accepted Practices Exchange (APEX) defines learning objectives as a “formalized statement of outcomes to be anticipated as a result of the educational process”. Learning objectives need to be measureable, so make sure you can follow through on evaluating the success of your participants in adapting their behaviour based on the knowledge transferred. Well crafted goals and objectives will enable you to determine your return on investment (ROI). Corporate events most likely will have a motivational component as well, such as increasing performance by doing more with less or increasing sales. That being said, the new normal for incentives also includes a significant component of learning and information sharing. None of us can afford to spend valuable company time solely on a giant party (not that a special social event can’t be part of the recognition aspect of a motivational event). Does your event have to reach an external audience or are the stakeholders all internal? This would form the basis of determining your communications objectives which can be turned into tactics further into the planning process. Does your event have a revenue target for the host organization or has the host organization set aside a certain budget allocation. These goal questions will be critical when it is time to develop the event budget and will guide many decisions throughout the planning process. While every event is different and the goals and objectives will vary, UCLA has a good check list which can help you develop your what’s, who’s, where’s and why’s. Bud Abbot was making statements, while Lou Costello was asking questions because they weren’t clear with each other. Make sure to learn from their confusion and clearly state and understand your event’s goals and objectives. Your stakeholders and your superiors will better understand your success if you do! Before you write your goals and objectives, take a moment and check out the classic routine. The Golden Nugget is coming! The Golden Nugget will periodically present event planning and management tips and ideas. We believe you will find them useful whether you are planning your first event or have hundreds under your belt. We look forward to the discussion around these golden nuggets by those with limited experience and more veteran planners. We invite readers to submit suggestions for topics to be discussed. Golden Planners Inc. is an Ottawa based full service bilingual event management firm which focusses on national conferences. After more than two decades of helping clients with their event management requirements, we want to share some of the best practices and ideas we have learned along the way. Feel free to let us know what you think about these subjects and share your knowledge through this blog.